Have you ever wanted to start-up your own animal control business? Growing urban areas are causing more human-wildlife conflict. This becomes a problem for both you and them. They become a nuisance; they begin looking for food and getting into your property. There is a higher chance of them getting hurt or killed due to traffic and smaller animals may draw in bigger ones. Now is your chance to help! You’ve been contemplating starting an animal control business but aren’t sure where to begin. That’s what A All Animal Control is here for. 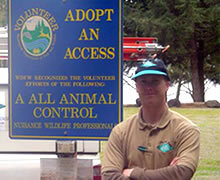 Take that first step to begin your journey into starting an Animal Control Business. We offer all the training that you will need and will provide support all along the way. Starting a new business is hard. A All Animal Control is here to guide you and help you build a client base to earn the income that you are looking to earn. We will assist you in getting your business license and finding the right insurance to protect both you and your valued clients. If you’re ready to start earning money helping your community and the surrounding areas with the growing wildlife nuisance problem, fill out a franchise information request today! Our energetic, experienced team is waiting to help you start the business you always wanted!